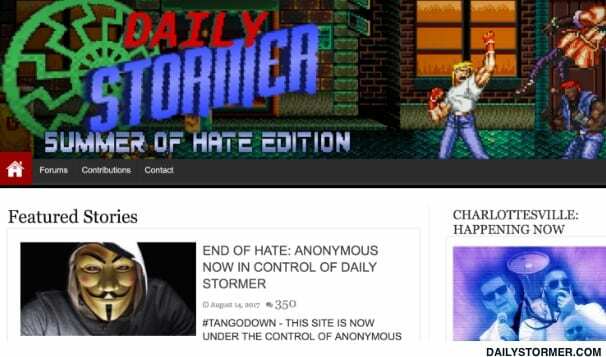 Leaders of the hacking collective Anonymous are denying reports that they hijacked the notorious white-supremacist website The Daily Stormer early Monday. A post near the top of the site declares “End of Hate: Anonymous Now in Control of Daily Stormer” next to an image of the hackers’ signature Guy Fawkes mask. Your Anon News, a Twitter account linked to Anonymous, posted statements suggesting the hate site itself was perpetuating a hoax to draw attention in the hours after its domain host GoDaddy gave it 24 hours before it was shut down for its ugly coverage of the Charlottesville white-supremacist attack Saturday. The Daily Beast previously reported on GoDaddy’s willingness to host the controversial site. This entry was posted on August 14th 2017 at 9:51am/09:51 and is filed under Elections, Live News Column 1, Politics. You can follow any responses to this entry through the RSS 2.0 feed.